(MP193). Frank Watson Wood (1862-1953). 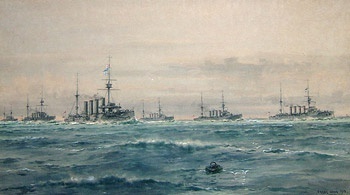 Watercolour signed and dated (LR) 1908. Original size: 30 x 17 ins (76 x 43 cms) approx. The squadron was a mixed bag of classes of cruiser and was under the command of Rear Admiral 1st Cruiser Squadron Channel Fleet, the redoubtable Rear Admiral Sir Percy Scott KCVO, CB flying his flag in HMS GOOD HOPE (Captain E H Grafton RN); the flagship is painted here by Wood left of centre. Astern of her appear to be the Armoured cruisers HMS BLACK PRINCE (Captain R F Purefoy MVO RN) and HMS DUKE OF EDINBURGH (Captain H H Stileman RN); and the ships of the squadron to the right of the painting are the Devonshire class ships HMS ARGYLL (Captain R G Allenby MVO RN), HMS HAMPSHIRE (Captain G A Ballard RN) and HMS ROXBURGH (Captain M Singer RN). Theirs was not a happy outlook! GOOD HOPE was Rear Admiral Kit Cradock's flagship when she was sunk with all hands by Graf Spee's squadron at Coronel on 1st November 1914, ARGYLL ran aground on Bell Rock in October 1915 and was a total wreck; BLACK PRINCE was lost during the night action phase of the Battle of Jutland in 1916; and HAMPSHIRE was famously mined off the Orkneys a week after Jutland when on passage in a full gale from Scapa Flow to Russia with the War Minister, Lord Kitchener, onboard. Only two of the six ships painted here in 1908, ROXBURGH and DUKE OF EDINBURGH, were to end their days in the relative peace of a breaker's yard in the early 1920s.